Tom Waits is singing about a man who is saying good-bye to friends, family, and loved ones as he prepares to go to sea. 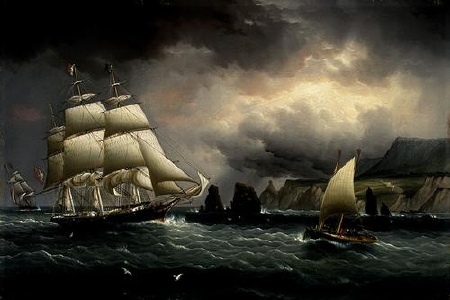 The painting also captures some of the ethos of being away at sea on a tall sailing ship. The painting and the song seemed apropos in light of the upcoming holiday “International Talk Like a Pirate Day”, celebrated on September 19th. I suppose this holiday resonates more with folks who think of pirates in terms of Errol Flynn and Captain Blood or Johnny Depp and The Pirates of the Caribbean than those who think in terms of current events in the Persian Gulf and the Straits of Hormuz. But “Talk Like a Pirate Day” also underscores an important dynamic of language, that the way we talk says something about who we are. This view of language is one of the themes of George Bernard Shaw’s play Pygmalion. Early on the play’s hero, Henry Higgins, says, “It is impossible for an Englishman to open his mouth without making some other Englishman hate or despise him.” Our speech reveals things about us, where we are from, the extent of our education, the kind of work we do. I studied theater in college. It was pointed out by one of my professors that many of the terms for those parts of the theater where lights are hung and sets are kept in readiness and many of the activities performed by stage hands had their origins onboard ships. This was because many of the early stagehands were out of work sailors. There were similarities, or so my professor suggested, between the skills required of an able bodied seaman and a stagehand. I do not know how much truth there is to this, I never spent much time in the professional theater, but it sounds plausible. There was a recent article in the Times Literary Supplement on the language expert David Crystal, “David Crystal, language geek”, in which Crystal describes some of his adventures in language. In one part of the article he describes working for Randolph Quirk (an interesting name for a language maven) on “The Survey of English Usage.” One day at work he received a phone call from a local shoe store. The marketing folks wanted some new adjectives to use in their advertising. Crystal thought the call was a joke but assembled a collection of words and sent it off. A week later he received a check for services rendered. Perhaps there is a suggestion here of another career path, in addition to teaching, available to the English major. As the illustrations above and below from medieval books suggest there is also a beauty to language, words, and the pages that contain them aside from what the words reveal about the people that use them. The making of books and the shaping of language can have a physical, a visual beauty that, though suggested by the literal meanings of the words, is separate and apart from the content of the language. The manuscripts are works of art in and of themselves and oftentimes the artistry of the decorations surrounding the words detracts from the words themselves. Some books offer pleasures that have nothing to do with the stories they tell. The textures of the paper and the bindings offer pleasures of their own. The illustrations and photographs that sometimes accompany a book are as satisfying as the book itself. I remember reading James Agee’s Let Us Now Praise Famous Men and thinking that my enjoyment of the book had as much to do with Walker Evans photographs as it did with Agee’s text, which was itself masterful. 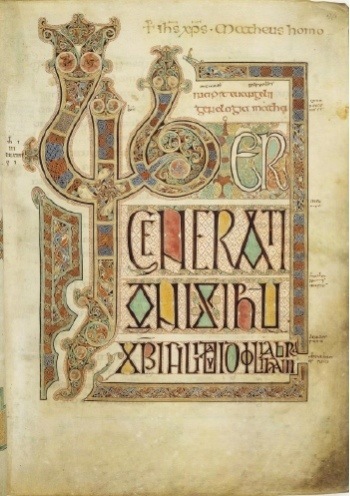 The Anglo-Saxons had a love of riddles. There is a riddle that I do with my twelfth grade students, “Riddle #60” from The Exeter Book. The subject of the riddle is “the reed” and the poem mostly focuses on how the reed, once carved into a writing implement, is used to convey “secret messages”, to pass notes, not in class, but in the mead hall. If one remembers that one of the primary entertainments of the mead hall was the singing of songs and the telling of stories set to music, the riddle of the reed completes a kind of “linguistic circle”, in that it provides an avenue for the written word in an environment dominated by the spoken word. 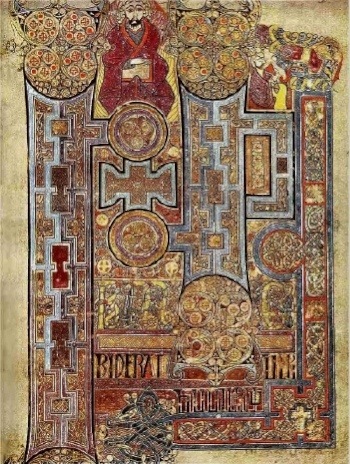 That the Anglo-Saxons and most of the other Germanic tribes that settled Northern Europe and Scandinavia took enjoyment from the “look” of their letters that is attested to by the many “rune-stones” that decorate the region. 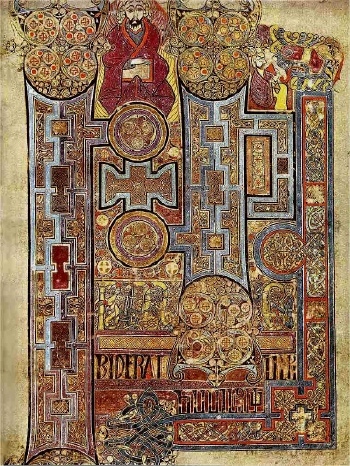 The earliest English poem is “The Dream of the Rood.” One of the forms in which this poem survives is as a runic inscription on a stone cross in Scotland. 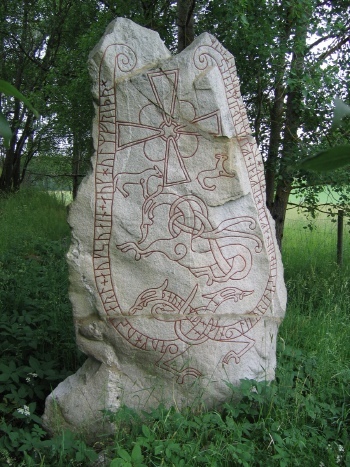 The stone cross consists of figures and patterns carved into the stone bordered by the runic text of the poem. I do not think one needs to be a follower of Tolkien’s hobbits to appreciate the visual beauty of these stones. The runic letters were also believed to have magical properties, a power that transcends their mere appearance, and for this reason their use was eventually forbidden by the religious authorities of the time. There is an irony in this because one of the few poets from the Anglo-Saxon period whose name we know is Cynewulf and the only reason we know his name is because he wove the runic letters of his name into his poems. It is not known for certain who he was, but he appears to have been a priest or a bishop, one of those responsible for the suppression of the runic alphabet. Hans Solo’s spaceship the Millennium Falcon is a pirate ship from another age, or at least one gets that impression from Hans’ descriptions of the work he did before joining the rebellion. As he talks of his exploits one is left with the sense that piracy was one of his many skills. The romance of a thing and the reality of a thing are often very different. Just as the romance of the cockney in English culture, the culture of Eliza Doolittle and her father, has a romance about it that is appealing to those on the outside looking in, the reality of day to day cockney life is very different. The poor are often depicted in ways that idealize their lives often to make them appear simpler or more genuine or in ways that accentuate the humor of their situation. Sancho Panza, Sam Weller, and Sanford and Son are characters who are endearingly poor. But there is another side to poverty captured in Maxim Gorky’s plays, novels, and memoirs or Upton Sinclair’s “Jungle.” It may be fun to talk like a pirate, but it is probably less fun to be a pirate or to be captured by one. The language we use to tell our stories often defines reality as it appears to us. Whether our stories create fictional worlds or capture bits and pieces of the world we inhabit, the language we use shapes a world that we expect readers to accept as real, as “believable”. The real world of poverty as perceived by Horatio Alger is a bit different from that same reality as it appeared to Charles Dickens but both authors expected their readers to accept as “true to life” the landscapes they crafted. Also the language we use often tells others, in some way, who we are. Often we employ a language that tells us who we are, a “character” that we assume as we might assume a secret identity. When words fail us we lose touch with who we are or think we are. It is often not the case that we cannot find the words to say what we mean but rather that we cannot find the words that both say what we mean while preserving the persona we have crafted for the world to see. We may want to talk like a pirate for a day because it is kind of fun, the hard work is in talking every day like the people we imagine ourselves to be. This blog speaks to the shifts in today’s society. There are so many people that just don’t see the affects of language and popular culture in our current state of society. It is hard to get a feel for what is really meant when something is said. Different styles of speech and the use of slang create a whole new language in itself. There are also lags in the knowledge of our world. People think so often of what is seen on television and movies and so little of is written and displayed by specialits, like artists. I like this blog because it opens the eyes of the reader without overwhelming. We all need to look past the television and the simple words in front of us to see a deeper meaning in what the world has to say. I agree that it is important to look beneath the surface of things. I enjoyed reading the passage about the “Rune-Stones” that decorated the region of northern europe. I thought it was interesting that they were wrote about in the early ages and are still standing today even though they were forbidden by the hierarchies or many religons. I thought it was interesting that they were believed to hold magical properties and thats why later they were banned. I also thought that it was interesting to hear about Cynewulf because he was believed to be a poet who wrote about the stones but also a bishop or priest that later suppressed the runic alphabet when he himself used it. Another thing that caught my eye was the beauty in these stones and how long they took to carve and etch the designs, and it left me wondering what each individual figure meant. Ever since reading The Hobbit I have been fascinated by runes. This blog interested me because it spoke partly of how our language today was developed. The American (English) language can be sort of complex. Influences from all around have been thrown together to create one new language. Many of our words come from some other place and have meaning but as time progresses, there are new words meaning new things being thought of all the time. Nowadays a lot of slang is used which is sort of its own language. They are words created from already real words, which is how our language was made with most of it being derived from Latin. Anyway this blog interested me because it gave me a little insight about how something today came to be. I agree. I think how language develops is fascinating.